Simon Yu, president of Arrow’s components business in Asia-Pacific (right) and Fanny Law Fan Chiu-fun, chairman of Hong Kong Science and Technology Parks Corporation (middle), in front of semi-autonomous motorcar (SAM). 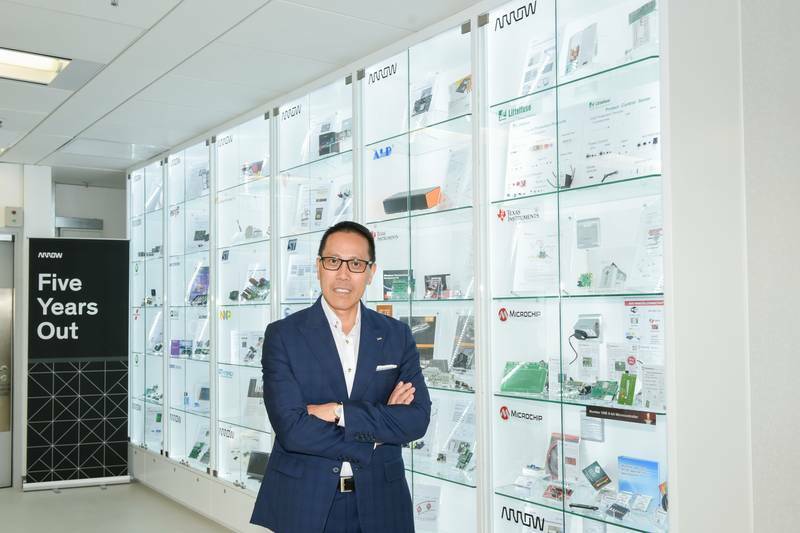 Simon Yu, president of Arrow’s components business in Asia-Pacific, in the newly launched Arrow Open Lab at Hong Kong Science Park. HONG KONG, CHINA--(Marketwired - Jun 2, 2016) - Arrow Electronics, Inc. (NYSE: ARW), today opened the Arrow Open Lab at Hong Kong Science Park, signifying a new milestone in Arrow's support of innovation and technology development in Hong Kong. To celebrate the opening of the Arrow Open Lab and illustrate how technology can help enhance people's lives, Arrow showcased its award-winning semi-autonomous motorcar (SAM) at the "APAC Innovation Summit 2016 Series - Robotics" conference organized by Hong Kong Science and Technology Parks Corporation (HKSTP) today. Speaking at the Arrow Open Lab opening, Simon Yu, president of Arrow's components business in the Asia-Pacific region said, "The Arrow Open Lab is open to all technology entrepreneurs, companies, and organizations pursuing innovation and product development in Hong Kong. It aims to help developers significantly enhance product design, shorten the development cycle and reduce costs." Hong Kong technology startups and enterprises are known to be good at understanding market demand, developing new ideas, IP research, product design, and software development. However, they usually lack support in engineering expertise, especially in areas such as wireless connectivity, sensing and controlling and system integration. Arrow's aim is to bridge these shortcomings and accelerate turning innovative ideas to sustainable businesses and marketing to overseas markets. For example, the timeline to develop a consumer device is usually five to seven months. Services provided by Arrow can help enterprises save up to four months of development time and up to 25 percent of engineering design costs. More importantly, as a trusted advisor, Arrow guides developers on how to improve their system design, and support them throughout the development cycle from formulation and proof-of-design concept, component sourcing, rapid prototyping, and testing to system integration and pre-production verification. The lab occupies a floor space of around 3,000 square feet and is equipped with state-of-the-art engineering equipment and testing modules. There are over a dozen experienced vertical segment experts and engineers with expertise in areas of embedded computing, sensing, connectivity and system integration on hand to provide professional advice to users. Allen Ma, chief executive officer of HKSTP said, "We welcome Arrow to be part of our community and appreciate its commitment to supporting Hong Kong technology enterprises in their innovation journey. Arrow's well-established international networks help innovators and developers access the latest technologies and connect to world-class suppliers. The Arrow Open Lab will elevate the support to local entrepreneurs to the next level and accelerate the development of advanced manufacturing in Hong Kong." Heartisans, a Hong Kong startup, collaborates with Arrow to develop life-saving wearable devices that monitor the heart conditions of heart disease patients. Tim Lui, co-founder of Heartisans said, "Arrow has a holistic approach to IoT deployment. The availability of global engineering expertise to startups like us, and the support, to help us manage the ever-increasing complexity of engineering, is extremely valuable. Our developers look forward to leveraging engineering resources at Arrow's Open Lab." According to the Global Startup Ecosystem Ranking study, Hong Kong is the 5th fastest growing startup ecosystem in the world. InvestHK's latest survey on Hong Kong's startup ecosystem indicated that there were 1,558 startups as of August 2015, an increase of 46 percent over the previous year. There is a growing demand for engineering consultation in Hong Kong. Arrow aims to support over 3,000 visits in the first year of the lab's operation. It is free of charge for registered members to use the lab's facility and services. To nurture and grow more local talent, Arrow also announced today an internship program available to university students. The interns will have a chance to receive training, mentorship and job opportunities from Arrow. Outstanding students will also have an opportunity to participate in Internet of Things (IoT) and robotics reference design projects. To celebrate the opening of the Arrow Open Lab, Arrow showcased the SAM project for the first time in Hong Kong today. Chakib Loucif, vice president of engineering for Arrow's Americas components business, spoke at the APAC Innovation Summit 2016 Series, and used the SAM project as an example to explain how engineering innovation could lead to a better tomorrow. SAM is an innovative and award-winning project led by Arrow Electronics. A 2014 Corvette C7 Stingray car has been modified with integrated advanced electronics and a human-to-machine interface so that a qualified quadriplegic driver can safely drive it by using only head movements. The SAM car enabled former racecar driver Sam Schmidt to become the first person with quadriplegia to drive a car at 107 mph (approximately 172 km per hour) at the Indianapolis Motor Speedway in 2014, garnering worldwide acclaim. Since then, Arrow continues to improve the performance and control of SAM. On May 22, 2016, Schmidt reached a top speed of 152 mph (approximately 245 km per hour) at the Indianapolis Motor Speedway in a newly designed SAM, making a new speed record. Arrow has a long history in supporting technology development in Hong Kong. In November, Arrow organized the Immersions event that connected IoT ecosystem leaders and developers to discuss the critical aspects of successful deployment of IoT. Earlier this year, Arrow moved its regional headquarters to HKSTP, further reinforcing its commitment to the region. 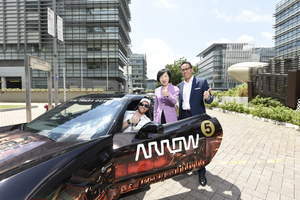 Simon Yu, president of Arrow's components business in Asia-Pacific (right) and Fanny Law Fan Chiu-fun, chairman of Hong Kong Science and Technology Parks Corporation (middle), in front of semi-autonomous motorcar (SAM). 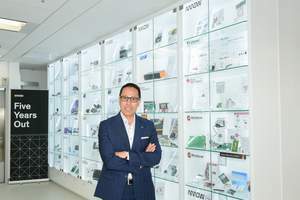 Simon Yu, president of Arrow's components business in Asia-Pacific, in the newly launched Arrow Open Lab at Hong Kong Science Park.